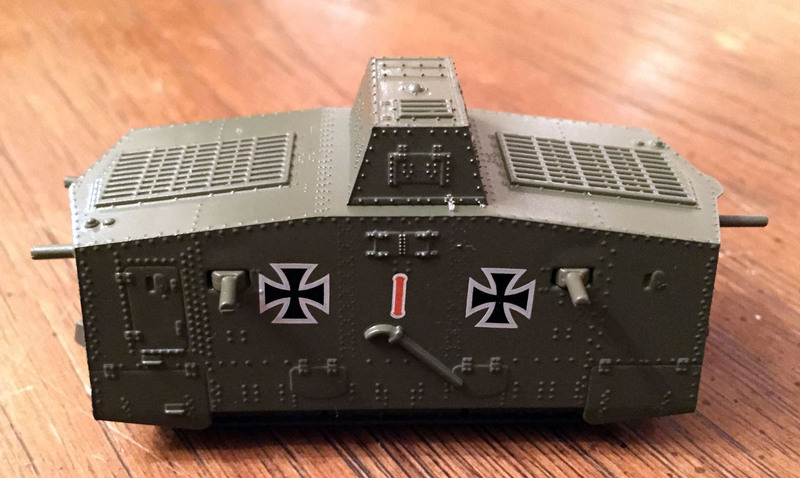 Since the powers-that-be hereabout have imprudently given me another platform, I’ll make this particular teapot just a bit more tempestuous: Memoir ’44 is a war game. The best-selling installment of Richard Borg’s Command and Colors system — and one of the best-selling war games of all time — is criticized for its abstractions, its toy factor, its simplicity, its lack of tactical granularity, and, for all I know, the devaluation of the dollar against the yuan. 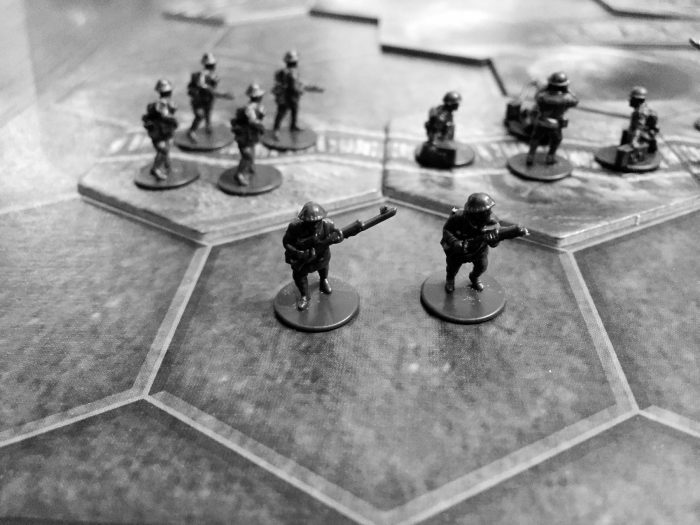 I for one, while acknowledging its limitations, love the toys, the card-play that creates uncertainty, the straight-forward rules, and the ability to fight the entirety of the D-Day landings in an afternoon. 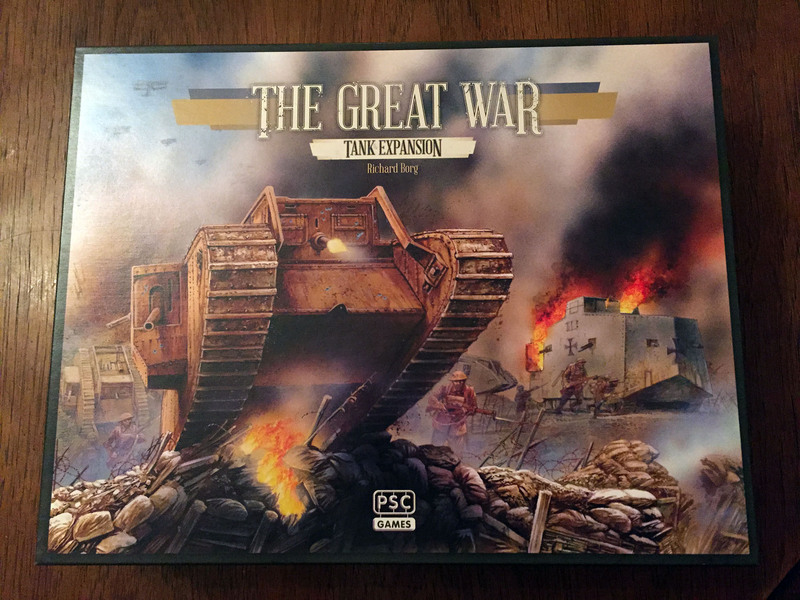 It shouldn’t, then, be too great a surprise that I was looking forward to the Plastic Soldier Company’s release of The Great War, Mr. Borg’s take on World War I, and particularly the tank expansion. 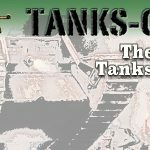 The bicentennial of the war is upon us and I wanted to see what tweaks would be brought to the system to make it more than just World War II with less elegant tanks. Some music to get us in the mood, perhaps? Much here is familiar to those who know the Command and Colors system. 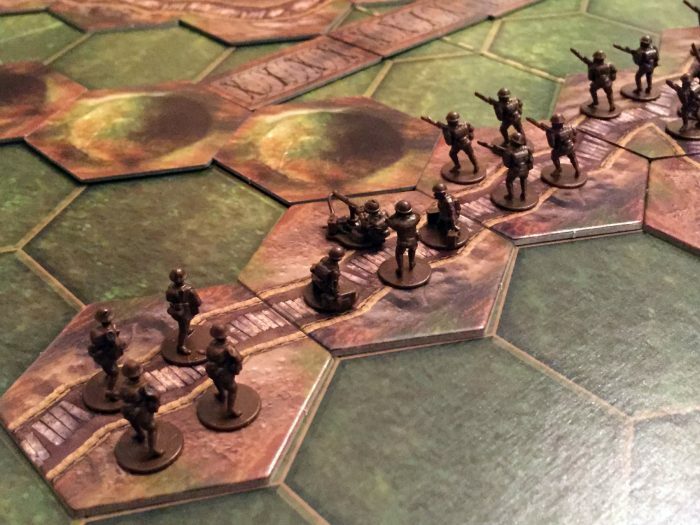 One begins with a blank battle board — one side green the other a blasted brown — divided into left, center, and right sectors. In this case, though, the map is a bit deeper. It now measures 11 X 13 hexes, closer in size to what will be used for the Napoleonic La Grande Battles system. I’m also fairly certain, although I have not checked, that the hexes are a wee bit bigger than those previously produced. 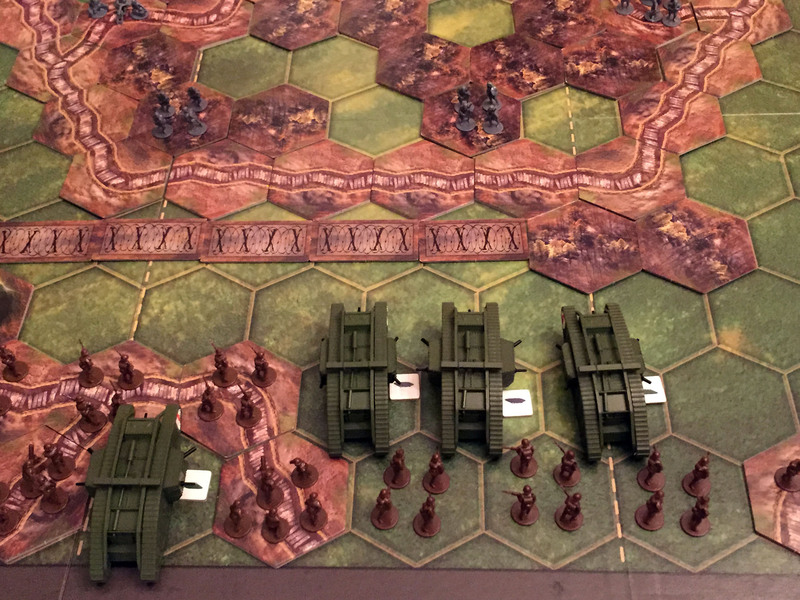 The map is ready-made for two-board epic The Great War battles as both faces have a row of half-hexes on one side intended to mate with a partner for the bigger battles. 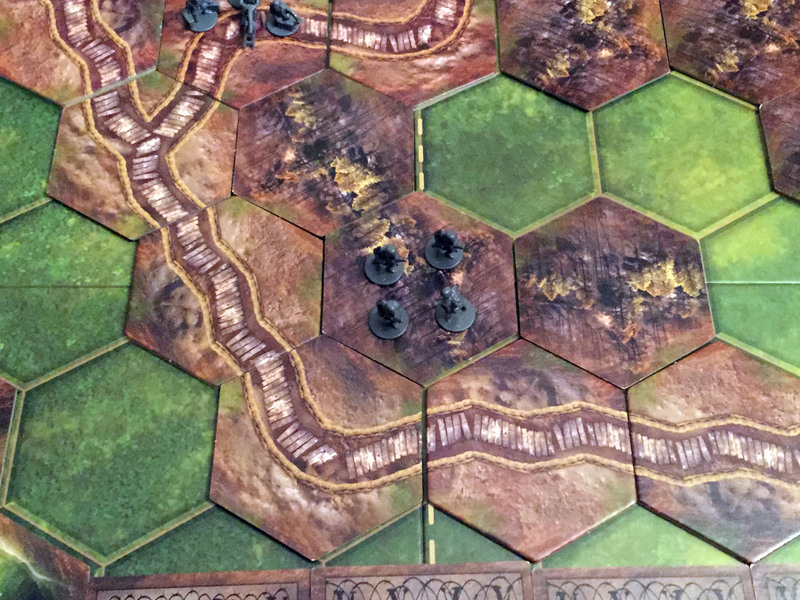 The terrain for each scenario is created by placing heavy cardboard hexagonal tiles representing hills, strong points, forests, rivers, swamps, and, yes, trenches. There are lots and lots of trenches. There are also a small number of rectangular ground feature cards for barbed wire, shell craters, and the like. These tiles are some of the best illustrated in the series and the maps when set up are very nice indeed. The series has dallied back and forth between plastic toys and wooden blocks and here it uses the former. If the internet fora are to be believed, this has been the most controversial part of this game. Having now experienced matters myself, I can attest that there is a special coat room in Hell for the genius who decided that some of the plastic infantry figures should be attached to their sprues by the most fragile part of their kit, viz. : the bayonet. I was warned. I acknowledge this. But, by the heavens, I am an old-school miniatures gamer who has never been above playing with 1/72nd scale plastics and I would be damned if I would let these board gaming sissies turn me away from chopping my Tommies out of their sprues with my trusty X-acto knife. Failing at this twice, I reverted to an old tactic of heating my X-acto knife in a candle flame before slicing the bayonet away. This worked well, although I cannot speak to the long-term effects of inhaling second-hand plastic smoke that this occasionally causes. I’m not entirely persuaded of the merits of the PSC providing soldiers in multiple postures. By my count, each army’s infantry comes in six different poses. 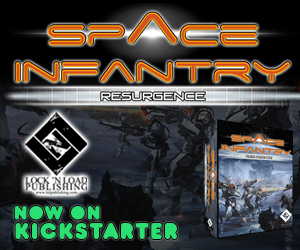 As is usually the case in Command and Colors games, infantry units are composed of four figures. My OCD is far too great to let me create these units out of anything other than matched figures making storing and deploying these boys more difficult than in Memoir ’44 where all the figures are the same. I will award bonus points, however, to the PSC for having the soldiers’ poses match the box art. A single “bomber” figure can be added to regular infantry units granting them more firepower. There’s also machine guns and mortars as well as their crews. The mortar men are single-piece figures, but the machine gunners require assembly and reminded me on occasion of my very worst days of trying to kitbash Crimean War Russians into Napoleonic Landwehr (it’s a long story). The grim hand of artillery was ever over the battlefield in World War I, and here it’s, wisely I think, abstracted. At the beginning of most scenarios one side is granted a preparatory bombardment into a certain sector. In addition, both sides are usually given reserve artillery barrages which fall from off-board and are, appropriately enough, susceptible to deviation. This is, however, notionally a piece in honor of “Tanksgiving” and it hasn’t yet spoken nearly enough about these smoky, noisy, ugly creatures (I write this as someone who finds the Panther almost lovely). 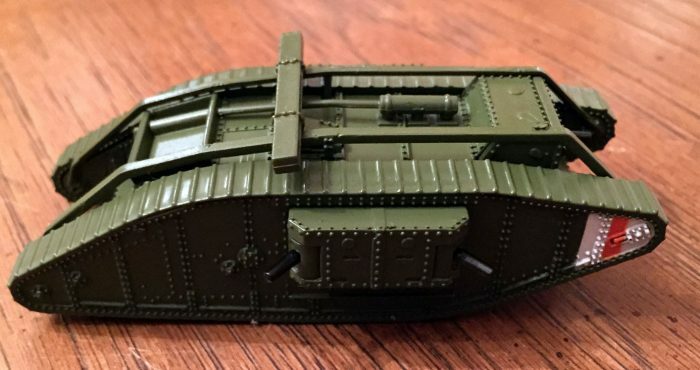 The tank expansion comes with two British Mark IV Male, two Mark IV Female, and two German A7Vs. For those who don’t follow such things, the “males” are armed with cannon while the “females” possess only machine guns. Freud would have had a field day. As might be expected from the PSC, the detailing and decal work is very nice on both tanks. Quick, now, boy or girl? In game, there are some fun new mechanisms to simulate the idiosyncrasies of these creatures. Over-rapid movement runs a risk of having the tank bog. 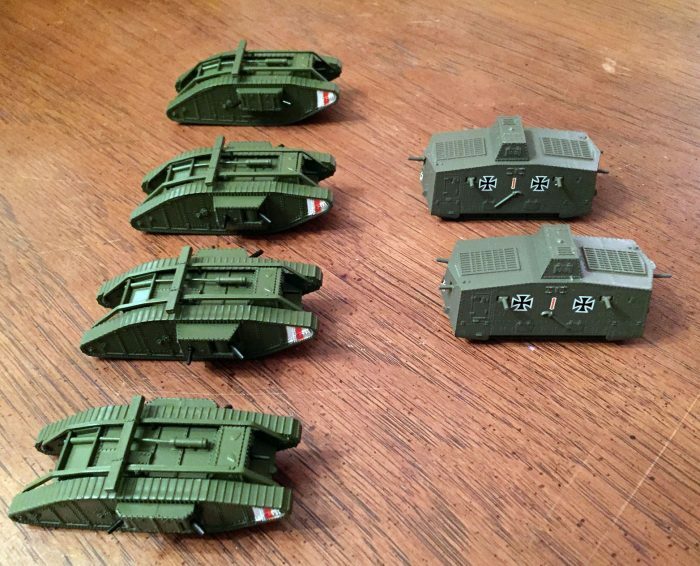 Their weapons are powerful, but each tank can only take so many hits, represented by the silhouetted chits in the picture below, before they become a wreck. Especially in the case of the early-war tanks like the Mark I, there are very few of these chits available and each tank lost results in the opponent receiving not the usual one but two victory medals. Special mention to the bog markers which are more lovely than they need to be, but really do enhance the overall appearance of the game. As I suggested a couple times above, the art design of this offering is the best in the Command and Color family. The cards that drive the action — each side, as usual, gets a set hand and plays (usually) one card per turn — have great period art and style. 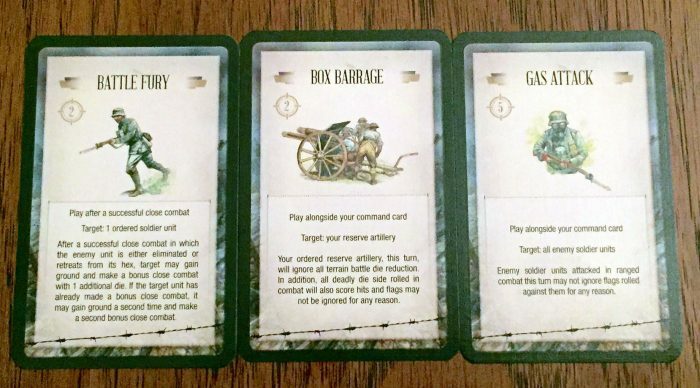 Similarly there are combat cards, powered by HQ tokens, that grant special bonuses or, more perniciously, special disadvantages to one’s opponent, when played. I’m particularly fond of the “Lice” card. My only regret is that the cards are not poker sized. This is a bit of economizing that should have been skipped. I approached this game and its expansion liking the series and they did nothing to change my mind. I suspect it will only be a matter of time before I break down and buy another set so that I can have a go at the epic battles. Who knows, perhaps the day will come when the Grogheads will host “Command and Colors Through the Ages”, featuring ancient, medieval, Napoleonic, American Civil War, World War I, and World War II epic battles, all on the same week. In the meanwhile, this is an easy recommendation for me and, Happy Tanksgiving!